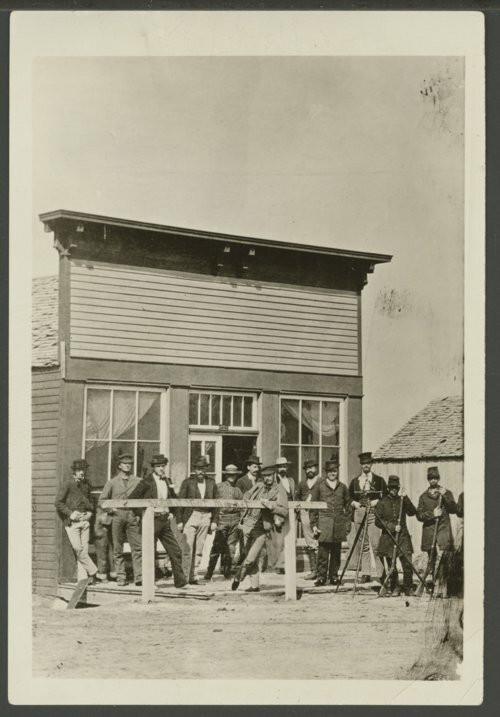 This is a photograph showing the first surveying party sent to Indian Territory, later Oklahoma. The surveyors are the four civilians at the right. In the fall of 1868, the United States government sent Edgar Demming, Daniel Short, Robert Poole, and Charles Daris to survey the northern part of Indian Territory. Shortly after this photograph was taken in Arkansas City, the four men were killed and scalped. A rescue party found the bodies on the banks of a small creek 20 miles south of the Kansas border. The bodies are buried in a cemetery in Arkansas City, Kansas.